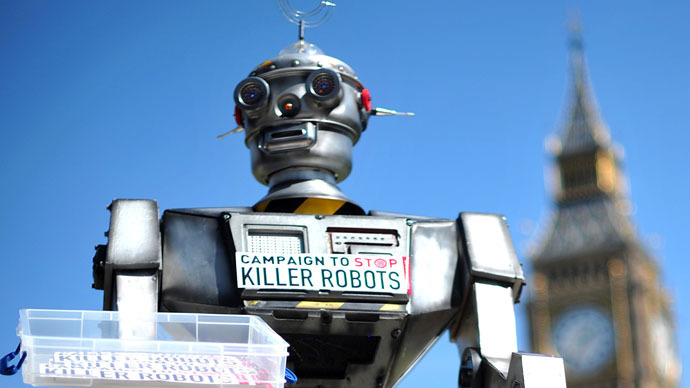 The UK is opposing an international ban on so-called “killer robots” at a United Nations conference in Geneva this week, which will examine the future of lethal autonomous weapons systems (Laws). There is currently no internationally agreed definition of what constitutes a lethal autonomous weapons system and the lack of legal groundwork for killer robots will be a main debate topic at the UN conference. The UK is among 120 countries which will attend the Convention on Conventional Weapons in Geneva from April 13 to 17. The Foreign Office told the Guardian: “At present, we do not see the need for a prohibition on the use of Laws, as international humanitarian law already provides sufficient regulation for this area. One of the main criticisms is the systems, by their nature, lack human control. Laws are operated via computers, enabling drones and other weapons to select targets and carry out attacks without direct human intervention. At the convention, complicated battlefields maps will be used to demonstrate how difficult it could be for an automated weapon to accurately select and distinguish targets. Many human rights groups have come forward to call for a legal framework and ban on these weapons systems. Last week, Human Rights Watch and Harvard Law School released a report calling for the creation of a new protocol to outlaw fully autonomous weapons. If an automated weapon were to attack a benign civilian target due to an error in its system or mistaking a target, the owner of the killer robot could not be held responsible because of a lack of current legal framework. Human Rights Watch is a co-founder of the Campaign to Stop Killer Robots and serves as its coordinator. This international coalition of more than 50 nongovernmental organizations is calling for a pre-emptive ban on the development, production, and use of fully autonomous weapons.